Westfield Football Club eased to its biggest victory of the season in its final game of 2017. 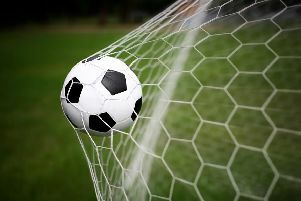 The Westies hammered a Rottingdean Village side which played the entire Macron Store Southern Combination League Division Two match with 10 men 8-0 at The Parish Field on Saturday. Hat-trick hero Allan McMinigal turns away from a tumbling opponent. Allan McMinigal led the rout with a hat-trick, Terry Payne came off the substitutes’ bench to score twice, Josh Carey and Asher Grindle netted once each, and there was also an own goal in the only Division Two match to beat the weather last weekend. Westfield joint manager Jack Stapley said: “It was a strange game and we weren’t at our best by any stretch, but to win 8-0 is still a decent feat to be honest. Carey, full of confidence after scoring four against Jarvis Brook the previous weekend, flashed a 20-yard curler just wide in the opening three minutes, but shortly afterwards Westfield needed a smart reaction save from Gavin Bourne to prevent them falling behind. Westfield defender Martyn Durrant wrestles with a Rottingdean Village forward. Bourne then comfortably saved a shot from outside the area before Carey had a couple more attempts at the other end, one of which saw him denied by the goalkeeper from an inviting position inside the box having been played in by McMinigal. A McMinigal shot from just outside the area was kept out by the fingertips of the Rottingdean goalkeeper low to his right and McMinigal’s shot following the resulting corner was also saved. Westfield opened the scoring when McMinigal’s corner from the right was met by a glancing header from Carey at the near post which hit a Rottingdean defender and ricocheted into the net. Rottingdean had a decent chance to equalise when a goal kick was flicked on and the visiting forward got goalside of Jack Stapley before seeing his shot well saved by Bourne. McMinigal opened his account with a brilliant header back across the goalkeeper from a Jamie Gravett cross which was slightly behind him. He then added his second and Westfield’s third. A ball into the box bounced around a bit before McMinigal shifted it onto his favourite left foot and picked out the bottom corner. Westfield led by four at half time after Carey intercepted a back pass from Rottingdean’s left-back and stabbed the ball past the goalkeeper as he came out for his seventh goal in the last four matches. The Westies improved during the second period, moving the ball quicker and fashioning a lot more chances than they had in the first half against a Rottingdean side whose centre-forward went in goal having picked up an injury just before the break. McMinigal completed his treble with Westfield’s fifth goal, curling the ball into the bottom corner from the edge of the box in trademark fashion with his left foot. The sixth goal came direct from a corner. Grindle swung the ball in with the wind and it sailed over the top of everyone before nestling in the far corner of the net. Payne came on to add the final two goals, the first of which was probably the pick of the bunch. Payne cut in from the left and unleashed a really good strike into the top corner. In addition to the goals, Westfield also had one disallowed for offside and a strong penalty appeal turned down in a one-sided encounter. “That’s probably the least enjoyable game I’ve had all season,” added Stapley. “I would rather come off the pitch having been in a battle and got beaten. “It was a job well done I suppose, and it was good to get people some minutes and blow the cobwebs out after Christmas. Westfield: Bourne; Gravett, Stapley, Durrant, O’Prey; Adams, McMinigal (Cochrane), Barrett; Shelton, Carey (Payne), Grindle (Ramsay).